Viking forces met opponents in various scales of engagement over the period 750 to 1250. Small groups : such as raided Lindisfarne and Tynemouth in 793/4AD comprised a few ship-loads of men and could be beaten-up by a bunch of armed monks. "When a man takes an unorganised crowd, arranges it, divides them into companies, groups them together and gives them a practical military training." "the science of military movements". Tactics are the practices and techniques used to defeat the enemy after he has been brought to battle i.e what you do to fight the enemy when he is nearby.Strategy has been used to get your forces into this situation.Tactics are techniques that can be practised and perfected. Large conglomerations of warbands : such as the Great Heathen Army which overwintered at Repton in 873-4AD and could take on the army of an entire kingdom. Scandinavians of 750-1250 no longer lived in a purely 'heroic' society. The evidence of the 'Bog Armies' shows us that kingdoms or tribes conducted warfare at a level where they could send hundreds of similarly-armed and organised men across the sea to pursue their interests already in the third century AD. This shows us that the idea of disciplined combat in groups had superceeded that of individual warriors competing against each other to daunt and defeat the enemy. 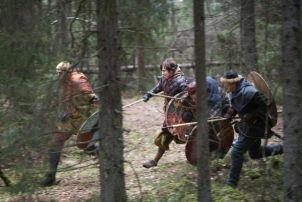 What happened when warriors met and fought we must reconstruct from contemporary accounts, contemporary illustrations, other pre-gunpowder accounts, anthropological evidence from pre-gunpowder societies plus a smidgin of experience from modern reenactment experiences.